Look who came home with me from Home Depot the other day. He jumped into my cart; what could I do? And look, he's like a little brother to the plant in the corner, a gift from a friend. Aww! For $4.98, you can grab your own. The 4-inch-tall pots come in turquoise and hot pink and all sorts of nifty hues, and the cacti vary, too. OOOh I got one of these in turquoise from Superstore (Cdn grocery chain). Love him!! Cute! I have a tough time leaving Home Depot without a new little plant orphan to add to the brood. That little cactus is seriously tempting! oohh I think I might have to pick up a few! Now I have a reason to follow DH into Home Depot this weekend! teehee! Wow, those pots are much more nimble than you would think at first glance, with the jumping and all. But they very obviously wanted to go home with you, and I think they look very happy. off to home depot we go! I love anything that comes in Mommy Size and Baby Size. These are so cute, and they seem very happy to be there. That is so weird! I was a Home Depot weeeks ago and saw these and thought of you! Cute and adorable. I love it! Both are my favorites! I hope they are available at the HDs in Boston! i was at crate and barrell yesterday and there was a lot of orange and jessica jones-esque designs. just a little f.y.i. Just what I need since I am a plant killer. Maybe a cactus would survive in my office. What a good little ambassador that pot is for the Orange Emporiium that is Home Depot! So enthusiastic. I might end up with the pink and turquoise too as I have been drawn there lately. Those are so pretty! I need some more planters, but never thought of going to Home Depot. I guess I need to step in there for a bit. They are adorable! I have a plant similar to your little one whom I call Spike. You can't kill it, even after 9 years and 3 different states! Love the pop the vase gives the plant. love it! especially with the bright green cactus in it! Thanks Jess... 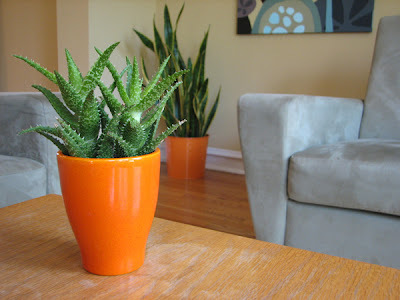 I have been looking for orange accents for months and those pots are just the thing! My quilting studio is decorated in purple and orange. I have found plenty of purple accents, but no orange. Never thought about Home Depot!